Islay distillery Lagavulin has brought its 200th anniversary celebrations to a close with the release of a 24-year-old single malt bottling, which is set to raise more than £500,000 for charity. 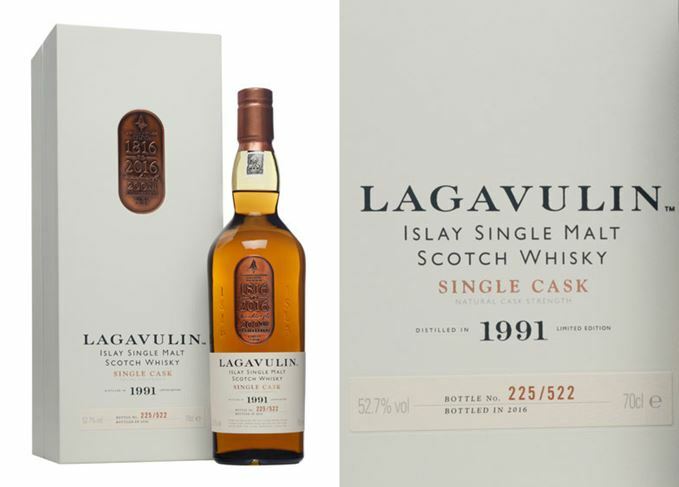 Only 522 bottles of single cask expression Lagavulin 1991 are available, with bottle number one due to be auctioned separately, and two more bottles to be donated to the Diageo Archive and retail partner The Whisky Exchange. Those interested in buying the single malt, priced at £1,494 and bottled at 52.7% abv, can enter a special ballot, open now on The Whisky Exchange website. The ballot will be drawn on 12 February and bottles allocated at random. The money raised – more than £500,000 – will be divided between seven charities on Islay: Islay Heritage, McTaggart Cyber Café, Islay & Jura Community Enterprises, Finlaggan Trust, Islay Arts, Islay Festival Association and the RSPB. Islay Heritage will be awarded a total of £310,000 for a number of projects, including research at Dunyvaig Castle on Lagavulin Bay and the creation of an Islay Heritage Trail. ‘We will all be raising a dram to years gone by and an exciting future ahead of us and this incredible island, as we close a year of spectacular celebrations for the 200th anniversary of the distillery,’ said Georgie Crawford, Lagavulin distillery manager. Famously smoky Islay distillery celebrates 200th birthday with two releases of special expression.